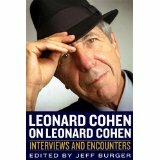 A treasure trove for Leonard Cohen fans—the dazzling, wide-ranging collection of interviews that Jeff Burger has unearthed not only offers the songwriter’s story in his own words, but reveals that Cohen’s language in conversation can be every bit as magnificent as his lyrics. That Cohen is brilliant is no revelation, but to witness that brilliance so lovingly expressed over the years is pure joy. That such a mind exists is hard to fathom, yet here’s the proof. He’s as funny as a great humorist, as wise as a scholar, and speaks in parables and poems almost as perfect as his songs. This is a great and rare window into the dedication it takes to be a true artist in modern times. Engrossing, entertaining, and endlessly inspirational. The legend’s best conversations have been collected into one illuminating new book, Leonard Cohen on Leonard Cohen. Editor Jeff Burger has selected interviews and quotes, many of which haven’t [previously] been published in English, that will prove as fascinating to Cohen newcomers as to his most diehard fans. I love the way Cohen speaks [in this book]—he is so disarming and seductive. I always burst out laughing; he is funny and deep. At 600-plus pages, this collection of interviews from various sources presents the singular Leonard Cohen in his own voice. The earliest piece is an interview on Canadian television in 1966; the most recent is an article in the Guardian from January of this year. Editor Burger divides the book into four parts: the 1960s and 1970s, when Cohen released some of his more durable classics, including “Suzanne,” “Bird on the Wire,” and “Famous Blue Raincoat”; the 1980s, when he released only two studio albums, one of which included his most famous song, the iconic “Hallelujah”; the 1990s, when he briefly flirted with living the life of a monk; and the new millennium, when he remarkably enjoyed the biggest successes of his long career. Burger includes interviews from major publications and media outlets (Rolling Stone, Maclean’s, New Musical Express, New York Times, CBC). Many of these pieces have not previously appeared in print. Cohen is endlessly quotable and endlessly entertaining, and there is great joy in reading his words, including the numerous pull quotes scattered throughout the text, such as “Professionalism is the enemy of creativity and imagination.” With a foreword by Suzanne Vega, this is a must for Cohen fans. Now we get to hear the man himself in these interviews that music writer Burger gathers . . . Burger’s discerning editorial hand selects those conversations with Cohen that offer insights into his music. For longtime fans as well as newcomers to his work. Burger presents a close-up and personal portrait of novelist, poet, singer/songwriter, cult figure, and sometime philosopher Leonard Cohen . . . This book will appeal to Cohen aficionados and researchers. Readers will gain a wealth of information about his take on life . . . This is a collection of more than 50 interviews Cohen conducted between 1966 and 2012. And if you think LC is even a fraction as imnportant to one’s sanity as I do, you’ll be interested to see what’s in it. The result is a fascinating and discursive oral autobiography . . . Cohen comes across as a remarkably intelligent and deeply serious artist who has always defined success as survival. [Cohen] is articulate, gracious, clever, and revealing . . . If you have any interest in Leonard Cohen, this volume offers not only insights into the Canadian singer-songwriter and his work but also a delightfully entertaining read.
. . . You will find so many other [quotes in the book] that are just as good that it would be silly for you not to own a copy. If we have to grow old . . . it is nice to have some eveidence that there are people who have done it before us with a level of reflection and grace that the more panicky among us can only dream of aspiring to. Recommended. One of the most articulate people in music, Leonard Cohen is a genuine rather than a pretend poet. And unlike most rock stars, he has no trouble being apt, interesting and wise. The triple threat makes Leonard Cohen on Leonard Cohen: Interviews and Encounters (Chicago Review Press) a considerably deeper read than most collections of music interviews. Judiciously selected interviews from Mr. Cohen’s four decades in the music industry trace the evolution of his public persona even as they illuminate aspects of his personal life and career that aren’t widely talked about . . . I came away admiring him, and loving his work, even more. Jeff Burger has assembled an excellent mosaic image of Leonard Cohen . . . and the results are both very thorough and very satisfying . . . it’s very easy to get swept up in the dialogue presented and these 569 pages fly easily by. These interviews are a far greater form of ‘biography’ than any of the recent books published. The artist can be seen in the process of shaping his persona through carefully weighed words, and he lets us have a glimpse into his life in song . . . The book is better than its title though no more complex in its conceit; it’s a swath of Cohen culled from various sources spanning five decades . . . [It offers] a portrait of a man who sounds like a hell of a guy to have dinner with. This hefty volume is a fascinating collection . . . Conducted between 1966 and 2012, these interviews delve into everything from Cohen’s loves and lyrics to his personal financial crisis. Leonard Cohen on Leonard Cohen: Interviews and Encounters wonderfully showcases the life and work of one of the most culturally influential men of the second half of the 20th Century. Very highly recommended for community library collections and a must-read for Cohen’s legions of fans. [The book] os sharply literate, as you might expect of the subject. What surprises, considering Cohen’s uber-serious persona, is the warmth and humor that comes through in these interviews and encounters. There is little to match hearing an artist discuss their work in their own words. This illuminating and insightful collection of interviews, conducted over the course of his career, has Cohen talking about his most famous songs—from “Bird on the Wire” to “Halleluhah”—as well as candidly discussing his romances, career, and becoming an ordained Buddhist monk.